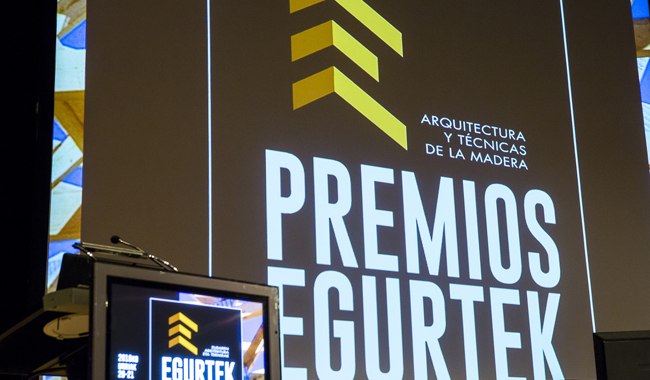 EGURTEK 2018 will present awards in five categories, for the best architecture and design projects in wood in the categories of “Building”, “Publication”, “Product Design”, “Local Wood (Basque Quality)” and “Interior Design”. In this way, the fourth edition of the awards is joined by a new category intended to distinguish the best project in newly built interiors or refurbishments, as well as ephemeral installations by architects, technical architects, decorators or interior designers. Accrediting a global conception that includes design, engineering, technical adaptation and urban development, regional integration, energy savings and sustainability criteria will be essential for candidates in this new category, which defends a holistic approach, which is also applied to the other categories. The recognition will be extended to all of the agents who have intervened in the development of the project, whether they are technicians, owners or constructors. Following the pre-registration, the competition will open a period for the presentation of proposals, the deadline for which will be 25th April 2018. The projects received will be evaluated by a jury, which will be made up of prestigious experts from entities such as the Basque-Navarra Official Association of Architects, the University of the Basque Country/Euskal Herriko Unibertsitatea, Baskegur-the Basque Timber Association, DPA Architecture, Arrokabe Architects (Winners of the Building Award in 2016), Bilbao-Bizkaia Design & Creativity Council, the Bizkaia School of Decorators and Designers and EIDE-Basque Association of Designers. Once the winners have been officially announced at a press conference on 8th June, the Award ceremony will be held at EGURTEK on 19th October. The Awards play a leading role as an initiative to raise awareness of the use of wood in this Forum. In 2016, the awards went to Arrokabe Architects in the Building category, the Disaro architects and designers in the Design in Wood category, Lekuona Architecture in Local Wood (Basque Quality) and the Esinal Ediciones “Arquitectura y Madera” magazine in Publications. Since its origins in 2012, Bilbao Exhibition Centre and the Basque-Navarra Official Association of Architects, with the sponsorship of the Basque Government’s Department for Economic Development and Infrastructures, have sought to reward the leading wooden architecture projects with a dual purpose. On one hand, to foster the debate around the use of this material in the professional group and, on the other hand, to make the experiences developed in this field in different countries of the world visible to society.